Today I want to write about a really cool species of dolphin, the Amazon river dolphin. Also known as botos, these beautiful animals grow up to 2.7 metres long and males are much larger than females. Amazon river dolphins come in a wide range of colours, including white, blue-grey and pink and they change colour as they get older. They usually live by themselves, are very slow swimmers and often swim upside down so that they can find food on the bottom of the water. They have the most diverse diet of any toothed whale, catching over 50 different kinds of fish, plus river turtles and crabs. Unlike most other dolphins, the bones in their neck aren’t fused together enabling them to turn their head up to 90 degrees, giving them flexibility when hunting prey in flooded forests. Amazon river dolphins are found in the basins of the Amazon and Orinoco Rivers in South America and are the most widespread of the freshwater dolphins. 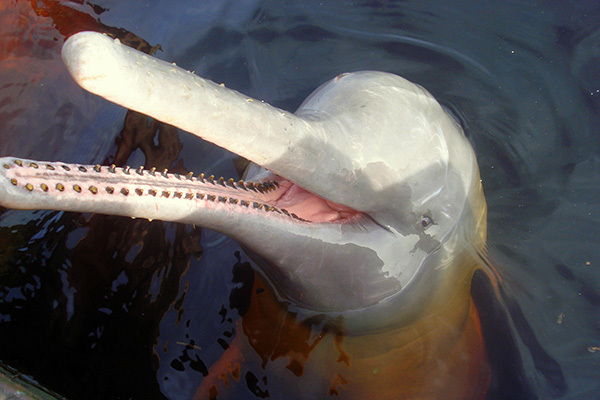 Are there any other interesting facts that you would like to share about Amazon river dolphins? That’s amazing how you cando that and want to become a zoolagist!